A plant sale at Crabtree Farms is an amazing and beautiful adventure. This week the pros offer a few tips and tricks for the new or novice Plant Saler. Arriving prepared can make for a smoother and more joyous experience. If you aren’t into crowds and want to get exactly the plants you’ve been pining for, then paying for a membership ($50) and taking advantage of the Thursday evening Members’ Pre-Sale (3-6), is well worth your efforts. It’s a quiet, low-key afternoon populated by serious gardeners and the farm staff. Similarly, if garden plants are your focus, consider attending the Friday sale. There are no vendors, live music, or activities on Friday, but the hours are expanded (9-3) and the farm is fully staffed with volunteers and employees to help you. Saturday (9-3) is typically the busiest day of the sale – especially in the morning. You may encounter a line at the gate waiting to enter. The farm is full of life Saturday and Sunday with vendors, live music, free activities, etc. Saturday the selection is better and the crowds bigger. If you care less about an exact variety of plant, and still want the vivacity of a festival, consider attending on Sunday (11-3). There are a few key items the pros know to bring: a wagon or cart, boxes or something to line the car with, gear for weather, and a water bottle. Though Crabtree has wagons and wheelbarrows available for folks to wheel around filling with plants (like a grocery cart at the store), they are always in short supply and high demand. Bring your own and you’ll be glad you did. The farm takes extraordinary steps to acquire free box flats and, recently, began buying and assembling box flats for customers to fill with plants while shopping, but it’s never enough. Save your squatty Amazon boxes and cut off the flaps or hit up the Aldi for empty box flats to bring to the sale. They are an excellent way to carry around your plants at the sale, and they make moving your new plants from wagon to car and car to house much easier. Plus, they keep your vehicle’s interior clean! 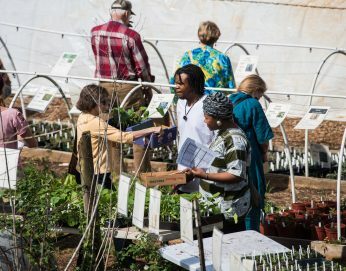 The plant sales are planned a year in advance, the seedlings are sown and timed to the date of the sale, and many volunteers and thousands of hours go into preparing for the weekend of the sale. Therefore, regardless of weather, the sale must go on! There is no rain date. These plants and the selection are a unique and valuable offering – you’ll not encounter anything like it at the boxy retail stores. So despite the curve balls of Mother Nature, getting out and braving the elements – be they warm sunshine or grey sleet – is always worth the effort. It is an outdoor event with little shade, so dress and sunscreen appropriately to be a happy shopper. And don’t wear heels – you’ll be glad you didn’t. On the Festival days, Saturday and Sunday, food and drink vendors will be present to indulge your hearty appetites. However, because the farm doesn’t believe in single-use plastic water bottles – you’ll not find bottled water for purchase. There are two water fountains in the Evelyn Center and the farm itself is plumbed with delicious, well water. So bring a water bottle and fill it freely! Expect parking to be an adventure unto itself. The farm staff creatively crams cars into all available nooks and crannies on sale days, but ultimately our space is limited and our driveway remains stubbornly one-way. This sometimes results in short waits to get into the farm as we wait for others to exit and free a parking space. It also means a walk from the car – though not nearly as far a walk as at the mall and the scenery is much prettier! Occasionally, folks have had to park in the neighborhood and walk into the sale. We have a special loading zone to accommodate shoppers’ needs to return with the car to pick up their purchased items. Expect lots of smiles and joviality. Plants and farms make people happy! The staff, volunteers, vendors, and other shoppers will be ridiculously friendly. At least, that’s what we’ve found to be true. Expect free admission and great kids’ activities, free demos, and free live music. Also expect to pay each vendor separately. Most have the ability to take cash and cards. All Crabtree products will be paid for at the registers. Expect to be able to use cash, check, EBT, and credit/debit cards for Crabtree purchases. We have had technological difficulties in the past, wherein a cell tower failed and our credit card machines went down. We’ve always found creative solutions to these hiccups and, fingers crossed, all will work smoothly this time. Please no American Express, all else is excellent. Expect to keep pets on a leash. We love your furry friends, but we’ve found that domestic animals behave unexpectedly around livestock. Our goats thank you for your kindness and diligence. Expect to be asked to Not Smoke on our property. Tomato plants are especially sensitive to tobacco products, which bring Tomato Mosaic Virus. So, for the health of our plants and livelihood, we ask you to abstain while on the property. Thanks! Birdsong, the beauty of nature, meeting new friends, the unutterable cuteness of a baby sheep, learning something new, finding a farm tucked into an unlikely and very conveniently located neighborhood, the sense of being a part of something bigger.